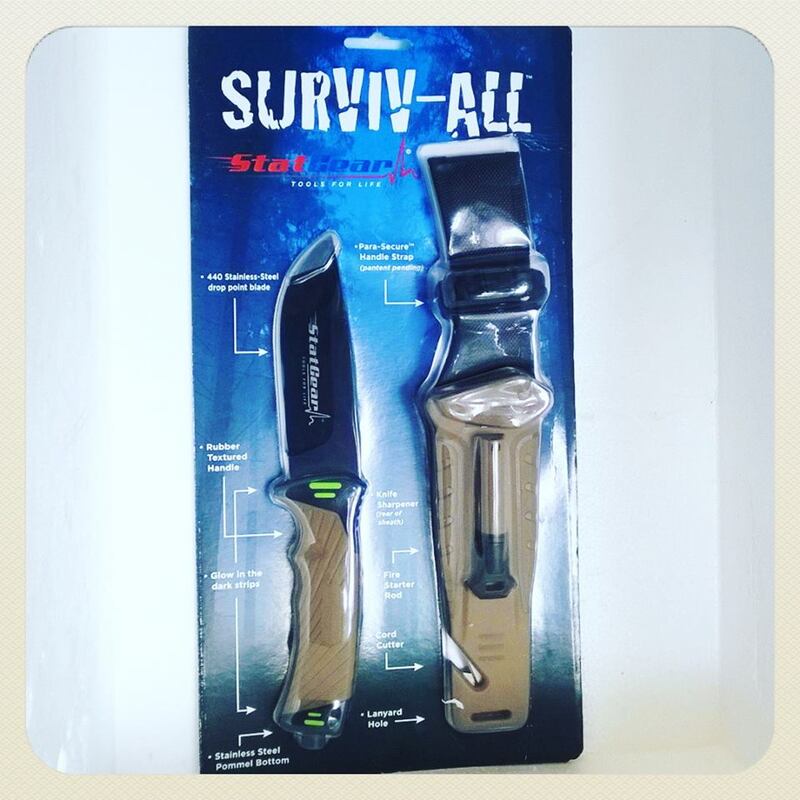 The Surviv-ALL knife, from StatGear is something you might want to give the hunter, outdoorsy, get into nature or get things done type of guys (and girls) and would be a fine piece of equipment for holiday gifting! At $44.99 you get a great, sharp and smooth looking knife, which is full-tang, weighted well, with a nice grip, drop-point blade and a snug holster. The holster has an attached, quality knife sharpening stone, chord-cutter AND fire-starter rod plus a patent-pending, para-secure paracord handle strap to hold the knife in place! As far as knives go, you can't beat this one for the price and it impressed my husband who is not easily impressed by anything! The only thing I would ever change about the knife is that I wish the fire starter rod felt a little more secure, or was holstered upside down to where it is now as it feels a little like I would lose that piece because I am prone to breaking things/losing bits of things and so for people like me, personally I'd love that to be secured the opposite way up, but other than that, this is one great knife I think anyone would be happy to receive - especially if you're going camping, fishing or what-not and have a little help by your side without carrying a truck load of accessories! You may not survive the holidays, but you will survive a lot of everything else, which is why the Surviv-ALL knife makes it into our Holiday Gift Guide, which you can find on Twitter with the hash tag #MGBHGG, or by clicking the tab at the top of this blog! Find StatGear on Facebook and Twitter, and get connected! Disclaimer: I was provided a Surviv-ALL knife to review and to share my honest opinions. Your views may differ to mine, thank you!